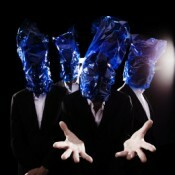 Formed in the year 2000, Bristol-based four-piece Get The Blessing boast a truly international fan base, having forged a unique signature sound that defies easy classification, yet never loses sight of thumping tunes, monstrously infectious beats, or joyous collective spontaneity. Their 5th album Astronautilus was composed between the crashing waves and deserted estuary sands of Cornwall, producing an album of pounding rhythms, spacious atmospheres and stronglycrafted melodies – plus, of course, the unpredictability and musical mischievousness that have made the band so exciting and successful. Astronautilus is dedicated to the memory of Ornette Coleman, who passed away in June 2015 and who was pivotal to the band’s formation. Despite several short breaks for other projects over the years – most recently in 2016 when drummer Clive Deamer was on tour with Radiohead – Get The Blessing have built a truly international fan base. testament to the free spirit that they embody.